Almost all of you know that apple cider vinegar has a wide range of uses, but only a few know how to properly use it. Therefore, this article will be of great help as it will instruct you on how to get the best effects from the use of vinegar! Namely, apple cider vinegar has powerful antiviral and antibacterial properties, and it is extremely effective as a household cleaning agent, in food, and for fighting infections. According to research, it is especially effective when combined with some warm water in the case of E. Coli bacteria in fresh food. Remember that the hotter the water, the better the effects. Vinegar is also able to regulate the blood sugar. Namely, it reduces postprandial glycemia (the major blood sugar crash after a heavy meal high in carbs. According to a study which involved type 2 diabetes patients, the consumption of 2 tablespoons of apple cider vinegar at bedtime for 3 days improved their blood sugar levels in the morning. Moreover, when the body becomes too acidic, it is prone to sickness. Therefore, in order to restore the health and wellbeing, you should bring the body to a more alkaline pH state, and the ideal level is 7.4. Apple cider vinegar is alkaline-forming as soon as it is digested in the body, so it will effectively balance the pH levels in the body. Blood sugar control- Add a tablespoon of APPLE CIDER VINEGAR to a glass pf water. A study on diabetes patients with increased insulin sensitivity showed that the consumption of APPLE CIDER VINEGAR before meals prevents and regulates blood sugar drops during fasting periods. Weight loss- Add a tablespoon of vinegar in a glass of water to lose weight. A 12=weeks study showed that subjects who drank this combination lost 1-2 pounds weekly. Muscle fatigue- Add 1 tablespoon of apple cider vinegar in a cup of water and drink it before a workout, to supply the body with electrolytes and thus treat muscle fatigue. 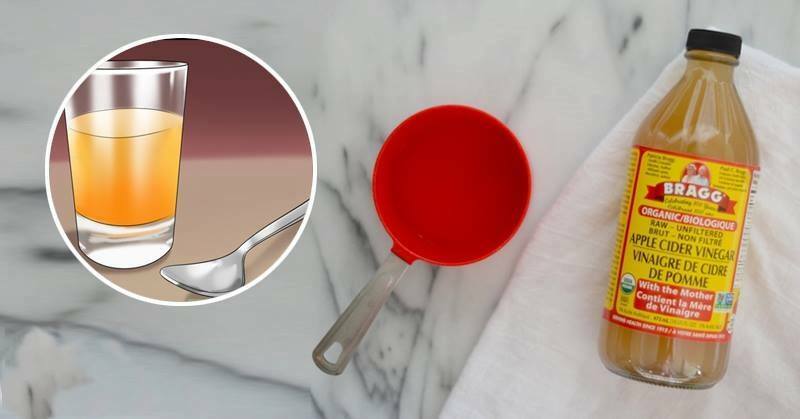 Apply a teaspoon of vinegar and a teaspoon of water to the affected area or on gauze or cotton fabric to soothe bug bites and burns. Apply a teaspoon of vinegar onto gauze or fabric and put it on the affected skin to alleviate eczema or itchiness. Add 1 tablespoon apple cider vinegar to a bowl of lukewarm water. To treat acne, rinse with this solution and then pat dry with a towel. Add a cup to your bath to relieve sunburns. Add a teaspoon of vinegar to a glass of water, and swish, spit it out and rinse again with water. This will help you get rid of bad breath and prevent cavities. Mix ½ cup of vinegar and ½ cup water and apply it to your scalp. Leave it to act for 1-2 hours, and repeat once a week to treat dandruff. Add a tablespoon of apple cider vinegar to a cup of water, and use it after shampooing, to provide a healthy shine to your hair. You should mix ¼ cup APPLE CIDER VINEGAR with dried herbs and some olive oil and prepare a salad dressing. You should combine ¼ cup APPLE CIDER VINEGAR, 1/3 cup olive oil, 2 tsp Dijon mustard, 2 tsp honey, and season it with salt and pepper. Mix a tablespoon of apple cider vinegar and two cups of water to make a fruit and vegetable wash before preparing. It will fight bacteria and disinfect them, so they will be safe for consumption.